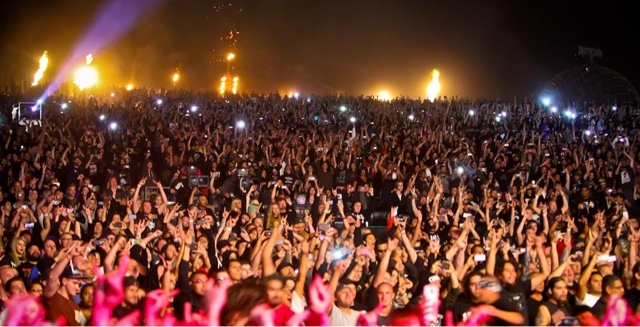 Knotfest is a weekend long heavy metal music festival that takes place in San Bernardino, CA. 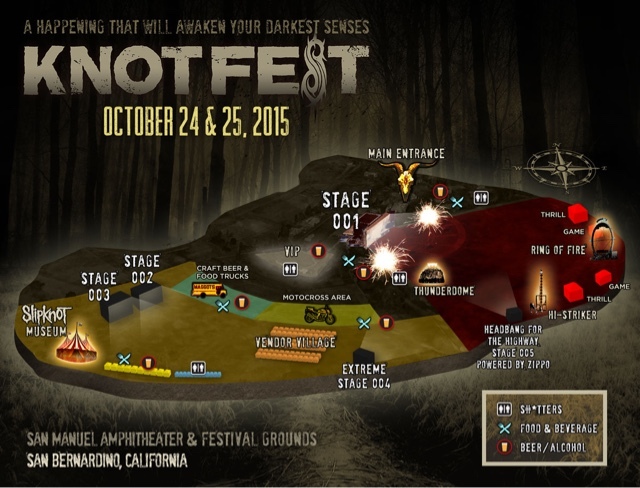 On October 23rd to the 25th, you can camp out for an entire weekend of chaos at the San Manuel Amphitheatre. This festival features the best in heavy music from all over the world! With 5 stages, 20 major festival attractions, and 40 full hours of absolute madness, this truly will be the event of the year! Overall, this festival will feature over 33 globally touring artists, and 18 regional bands showcasing the outright best in heavy music. 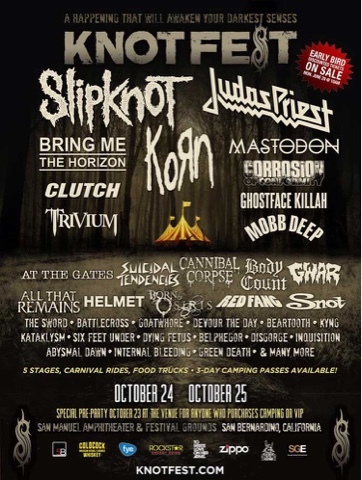 Some of our favorite bands such as Korn, Slipknot, Bring Me The Horizon, and Suicidal Tendencies will be killing it up on the stages at Knotfest making sure you have the ultimate heavy metal experience! All campers and VIP ticket holders will be welcomed into the festival a night early for intimate performances as well as the first look at some of the Knotfest attractions, including the legendary Slipknot museum! Other attractions that will be seen here are Massive Fire Hell Zone, Packs of Freakish characters, the scariest ride from the Clown’s Childhood at the Iowa State Fair, THE RING OF FIRE, a Fighting Thunderdome, a Festival Zipline, a sideshow freakshow, and many more to be announced. Now, what the hell are all these things? We have no idea, but they sound insane so you will just have to check them out and let us know! Of course, drinks, food, and a large dose of chaos will be served cold. We would love to hear all about your craziest heavy metal concert/festival experience! Leave a comment down below telling us all about it!